With the arrival of my niece - the first girl to be born after four nephews - I’m very excited and bursting with clothing ideas and projects for her. Here is a super cute and quick project, that is making use of her father’s work shirt which no longer fits him and some beautiful block prints that I brought from a craft show. Good to know: Keep hold of the shirt sleeve fabric, so you can experiment with your printing blocks and colour choices before you commit to your final design. If you don’t have any printing blocks, you can easily create your own designs by cutting into foam pads or vegetables such as potatoes. Firstly, you need to deconstruct the shirt by removing both of the sleeves. Cut along the stitching line, so that you retain the shape of the armhole. Remove the collar and yoke of the shirt by cutting across the shirt, from armhole to armhole and where the first buttonhole finishes. You may want to draw a line with a ruler and tailor’s chalk first, to make sure it is straight and even on both sides, before cutting. Decide on the printing block and colour to use, then prepare the block by placing a medium amount of paint onto a plate first. Lightly distribute the paint onto a sponge and use this to apply a light layer of paint to the printing block. Note: You do not want to apply a thick layer of paint onto the block, as you will lose the detail. To prepare the fabric, undo the shirt buttons so that the fabric can be laid out flat (you might also need to give it a press). Before you start to print, place a whole newspaper underneath the fabric so that you have something to press into, to achieve a more even and clearer print. Press the block onto the fabric and repeat as desired, ensuring you carefully re-apply the paint with the sponge after every print. To ensure that the prints do not come out in the wash, follow the manufacturers instructions on how to fix the print (I needed to apply heat to mine for two minutes with a hot iron, once the paint had dried). To finish the edges of the armholes - fold over and press a narrow double hem. As the seam is on a curve, you will need to clip into the first fold only around the curved areas to allow the seam to lie flat. Stitch in place with a straight stitch. Create a casing for the ribbon: Pin the button placket in place first, then fold over a single hem of approximately 1 cm. Complete the casing by folding over a further 3cm hem (actual width depends on ribbon width). Press and pin in place before securing with a straight stitch. Repeat this process on the other side. Attach a safety pin to the end of the ribbon and thread it through the casing to create your neckline and shoulder tie(s). You can have the shoulder tie on one side by leaving the ribbon in one piece, or on both sides by cutting the ribbon length in half. You will need to adjust the length of the ribbon when trying on the dress. For added detail, you can create little patch pockets, using the leftover sleeve material. I have used the cuff placket as my pocket opening, so I do not have to hem it myself. To get a symmetrical pocket shape, fold the fabric in half - matching up the placket edge - and cut both layers at once. Then use the pocket shape you have just cut out as a template for the other pocket, by pinning it in place then cutting around it. You may want to add a little more print detail onto the pocket before you attach it to the dress. Repeat printing and fixing (steps 4 and 5) on the pockets. Before attaching the pockets to the dress, adjust the stitch length to the longest your machine will give you and sew a line of straight stitching around the edge of each pocket, using the edge of the presser foot as a seam allowance guide. Gently pull the bobbin thread so that the fabric begins to gather. Distribute the gathers into the curved part of the pocket, giving a smooth, curved shape, then press the raw edges in to the wrong side. Pin the pockets into position on the dress, making sure they match up and are level. 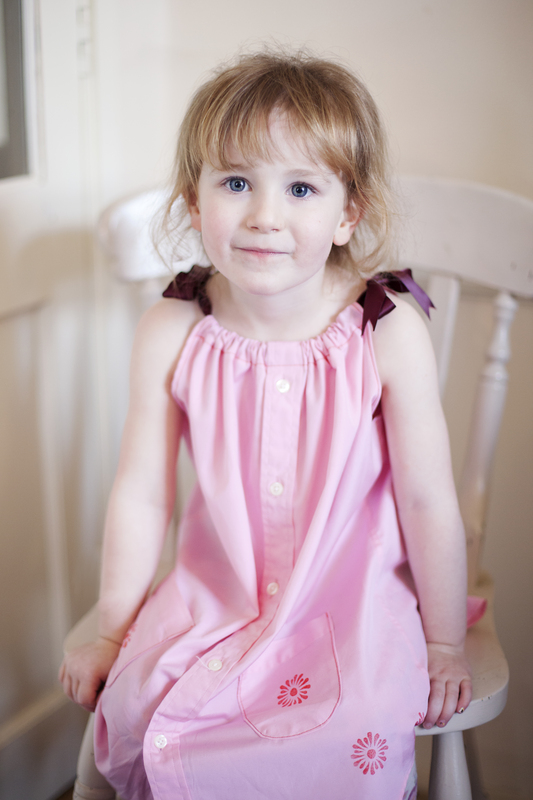 Secure with a top stitch (straight stitch) to finish the dress.